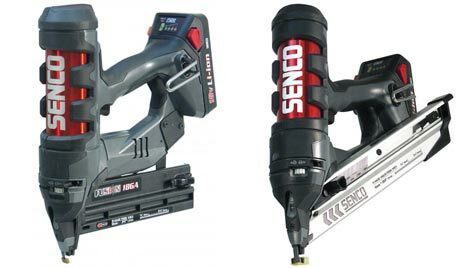 It has been a while since we have heard anything from Senco about their new Fusion cordless nail guns, but a new batch of information has come out that points to a release coming this May. If you are in the market for a new cordless nailer, it would probably be wise to wait one more month and see what Senco has to offer in person. The Senco Fusion uses an 18 volt battery to compress a nitrogen filled cylinder; it is the use of this compressed nitrogen that drives the nails. The Fusion is powered with a Lithium Iron Phosphate (LiFePo4) battery that can reach an 80% charge in only 15 minutes and deliver up to 500 shots on a single full charge. The guns weigh in at 6 pounds, which is said to be nearly 2.5 pound lighter then the competition. The Senco Fusion FN55AX 18-gauge Brad Nailer will fire slight head and medium head straight strip brad nails between 5/8” to 2-1/8”. The Senco Fusion FN65DA 15-gauge Finish Nailer will fire angled strip finish nails between 1-1/4” to 2-1/2” in length. Both models feature a sequential or contact trigger switch, tool-free depth adjustment, an LED work light and will include a 2 year tool warranty.